First of all, I promise I’m only behind in my book-reviewing and not in my book-reading! 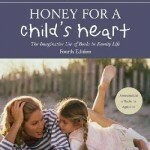 Two weeks ago I finished reading Honey for a Child’s Heart by Gladys Hunt. First published in 1969, this book is now in its fourth edition* and has been read by many, many parents as they endeavor to encourage a love for and environment of reading in their homes. The author spends time presenting reasons why reading is important for a number of things, including teaching values, cultivating the soul and imagination, building character, and uniting a family. At times I felt she didn’t communicate all her ideas in a completely coherent and/or compelling manor, but nonetheless found myself freshly energized and re-inspired to appreciate reading as the vital part of family and home life that it should be. That said, I think the real value of this book lies in the second half, which is an extensive annotated bibliography of books for children of all ages. I found myself pouring over this list and searching amazon for prices and availability, and it was so much fun! I’ve known there are lots of good books to be had for my children, but sometimes it is daunting to weed through the thousands that are on the market for those that are worth having and exposing our children to. This list, which is long and chock-full of wonderful ideas, is also shaped by Hunt’s love for the Lord, her appreciation for good literature and art, and her desire to see children and families encouraged and built together. Without a doubt, this bibliography will help choose many of the gifts we give our children throughout this coming year, and will undoubtedly be referred to throughout many more years for ideas and inspiration. All in all, if you want your children to grow up in an environment that cherishes reading and the bond that can be shared together through a book, you need to have this book on your shelf! It is a worthwhile read– and the bibliography alone is worth the price! *The edition I have is an older one. I assume there aren’t many significant alterations to the newer edition, except perhaps that some of the books listed in the bibliography that are no longer in print aren’t included any more, though I can’t even say that for sure. I read and used this book in my new years as a homeschooler, and came home with bags for my readers from the library. It has been a great resource when I drop by the used bookstore and weed through all the titles. She encourages the use of all types of books with the old and the young…and I must say, there are certain picture books I simply love! :) It is neat watching a certain book’s ideas or pictures appeal to a person whether big or small, and have them read it again and again. I had to comment, as this book is like an old friend to me. Thank you for your thoughts! I have the Fourth Edition, which I bought through My Father’s World. The authors of MFW included a note with it, pointing out that the Harry Potter books are included in this edition and their disappointment that such a controversial series was added. However they still feel her book list is the most balanced and complete they could find. I have found it to be a great resource.